Ray Release VIMS researchers Bob Fisher, Kevin Weng, and an unidentified colleague release an acoustically tagged cownose ray into the York River near the VIMS campus in Gloucester Point. © VIMS. A new study closes the loop on the annual migratory pathway of cownose rays along the U.S. East Coast, suggesting that mature animals likely return to the same nursery grounds in Chesapeake Bay and other East Coast estuaries each summer after overwintering in Atlantic coastal waters off central Florida. 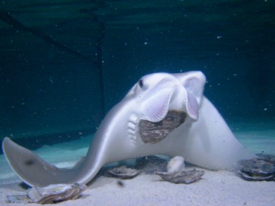 The study, published in Marine Ecology Progress Series, marks the first time scientists have tracked cownose ray migrations along the Atlantic coast for a full year or more, and offers needed information for managing these animals in light of concerns about their predatory impacts on farmed shellfish and vulnerability to fishing pressure. The project was led by Matt Ogburn and colleagues at the Smithsonian Environmental Research Center as part of the Smithsonian’s new Movement of Life Initiative, with contributions from Robert Fisher of the Virginia Institute of Marine Science and researchers at Savannah State University. Fisher, Virginia Sea Grant fisheries specialist in Marine Advisory Services at VIMS, has been studying cownose rays for nearly three decades, ever since reports of rays feeding on Chesapeake shellfish beds led to concerns about possible impacts to the Bay’s growing aquaculture industry. Research by Fisher and others showed those concerns to be overstated, while illuminating the rays’ own vulnerability to a proposed control fishery and an upsurge in bow-fishing tournaments. Cownose rays are particularly vulnerable to intense fishing because they reproduce slowly. Most mothers give birth to only one pup a year, and they do not mature until age 7 or 8. The discovery that rays likely return to the same nursery spots each summer would only increase this vulnerability, as it suggests that the Chesapeake has its own distinct population. Intense fishing of Chesapeake rays, especially during summer, could thus wipe out a large slice of the species’ genetic diversity. The current project builds on a 2017 study by Fisher and VIMS graduate student Kristin Omori, in which they used pop-up satellite tags to provide a broad glimpse into the rays’ poorly known migratory patterns. That study revealed that male rays exit the bay in July, migrating northward to a secondary summer feeding ground off the coast of southern New England before migrating south again in September to rejoin females exiting Chesapeake Bay. The data show that male and female rays then travel together to southern wintering grounds in the Atlantic coastal waters of central Florida. During the current study, the teams instead emplaced acoustic tags, which emit a series of “pings” unique to each tagged ray. These pings can be tracked by an array of hundreds of receivers along the Chesapeake and Atlantic coastlines, placed there by scientists from institutions along the East Coast to collect and share data on different species. If a tagged ray passed within half a kilometer of a receiver, the receiver would record data about the ray’s location. The data were then shared through the Atlantic Cooperative Telemetry Network and Florida Atlantic Coast Telemetry Network. 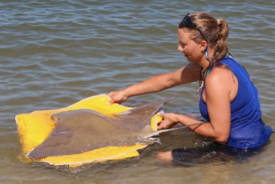 Most of the rays were tagged in Virginia at VIMS, with five in Maryland and two in Georgia. Of these rays, 28 had their signals detected multiple times over a period longer than 90 days, enough time for scientists to get a sense of their migratory behavior. Regardless of where scientists tagged the rays, every ray they detected in winter went to the same spot identified in Omori and Fisher’s earlier study: a region just off the coast of Cape Canaveral. 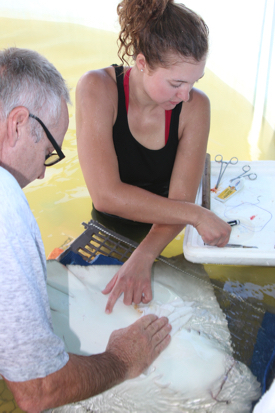 The greater challenge was figuring out if cownose rays go back to the same places each summer. While most rays returned to the same regions where scientists tagged them the previous year—some even to the same rivers—many rays were tagged in the fall, when they might have already left their summer homes. Only five rays sent out location signals for both summer 2015 and summer 2016. Four of those rays (three from Virginia and one from Georgia) returned to their original regions. The fifth spent both summers in the Chesapeake, but the first summer in Virginia and the second in Maryland. While scientists have unraveled one mystery about cownose ray migrations, there are still many unknowns surrounding the animals. Not least, the authors emphasized, is their role in the Chesapeake Bay ecosystem. By turning over the sediment, a bit like tilling a garden, they could play a vital role for organisms like shellfish and crabs that live on the bay floor. As Maryland develops the first official management plan for cownose rays, studies like this will offer more guidance on how to manage one of the most enigmatic creatures in the Chesapeake.